With exorbitant data growth both in volume and quality, broadcasting companies must take a critical look at their processes and workflows, upgrading to new technologies capable of delivering the cost and operational efficiencies that will support the needs of the business and enable the creation of greater revenue. This requirement was no exception for the leading body for film in the UK, the British Film Institute (BFI). The­ BFI­ National­ Archive ­holds ­one ­of­ the­ largest­ film­ and­ television ­collections­ in­ the­ world. Dating from ­the earliest­ days ­of­ film­ to­ the ­live ­capture ­of ­current­ television content, the collection contains over a million titles. In 2012, the BFI launched its Unlocking Film Heritage project as part of BFI’s Film Forever strategy. ­ A­ core objective ­was ­to ­digitise­ 10,000 ­films­ from ­the ­BFI­ and­ UK ­regional­ and national­ film­ archives ­by­ the ­end ­of­ 2017, ­and­ to­ provide­ safe­ and­ secure­ long-term­ storage of and access to heritage­ film ­in­ a ­new digital preservation­ infrastructure. The ­new ­digital­ repository ­needed ­to ­integrate­ with­ existing­ workflow­ applications, ­be ­flexible­ with future ­applications, ­and­ accommodate ­predicted­ data­ growth. The BFI team was also concerned about being locked into a single vendor’s technology drive and media roadmap. They relied on the trusted expertise of OvationData, worldwide provider of sophisticated and scalable data management solutions, to determine the best strategy. OvationData selected a digital tape solution as the best choice for the BFI’s unique storage requirements. 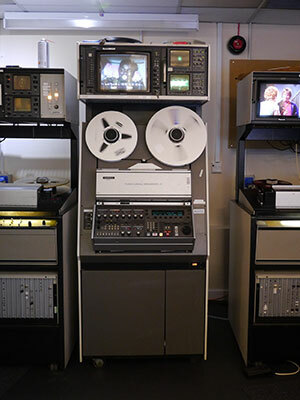 Several tape-based market options were in consideration for this new digital preservation infrastructure. The preferred solution was a Spectra Logic architecture with two expanded Spectra® T950 Tape Libraries and two Spectra® BlackPearl® Converged Storage System appliances. Spectra Logic technology is non-proprietary and integrated easily with the BFI’s Imagen media­ asset management. ­ The BFI­ configured­ its four-frame T950 with LTO-6 drives and media, and its dual-frame T950 with IBM® TS1150 tape technology, creating both genetic diversity and eliminating future roadmap worries associated with implementing a single technology. The digital archive solution operates flawlessly, enables ­quick,­ easy ­public­ access, and has proven to be the best-in-class, long-term digital preservation for the nation’s cultural assets. Spectra BlackPearl Converged Storage System ­was­ designed­ to­ provide a modern, simple portal to a multi-tier storage architecture and to break away from traditional and legacy solutions that are based on licensing models, driving greater cost when scaling. Designed for organisations where content and long-term integrity is at the core of their business, BlackPearl ­allows data­ to ­move ­seamlessly­ to disk, tape and cloud storage, in a way not­ previously­ possible. BlackPearl enables­ users to deploy multiple tiers of storage to create an architecture that is cost effective, easy to manage and scalable to exabytes of data. BlackPearl’s­ simple ­RESTful­ API­ and­ integrated advanced bucket management (ABM) retains and manages organisation’s assets at very low per-gigabyte costs. Spectra T950 tape library is designed and built to meet the stringent requirements of the enterprise for data integrity, data security and high reliability. The T950 library reduces staff involvement­ significantly,­ affordably­ scales­ in capacity and throughput, and delivers the best total cost of ownership of any tape solution. Support options range from the­ expected­ 24x7 worldwide­ on site ­support to more advanced offerings including Spectra’s ­industry-first­ Assisted­ Self­ Maintenance (ASM) program as well as proactive management and reporting tools that ensure optimal system availability. The genetic diversity deployed in BFI’s solution powerfully strengthens its digital preservation strategy. It is a key measure to ensure data security, essentially storing information across more than one media type to digitally preserve data indefinitely and prevent against vulnerability to attacks. The challenges created by the transforming M&E market are driving the need for greater efficiencies and ROIs. Those willing to take advantage of modern technologies, position themselves to reach new audiences, maintain an edge on competition, while safely preserving their digital assets. Stephen McConnachie, Head of Data and Digital Preservation, BFI said "Our Spectra Logic solution has helped us create a content strategy to preserve the BFI National Archive digital collection long-term. BlackPearl integrates seamlessly into our workflow applications and allows us to easily store and quickly access our files on tape libraries. The non-proprietary format of the system and its genetic diversity gives us confidence in our system’s future roadmap." The British Film Institute (BFI) is the UK’s lead organisation for film, television and the moving image. It is a cultural charity that curates and presents the greatest international public programme of British and World Cinema for audiences; in cinemas, at festivals and online. The BFI cares for the BFI National Archive – the most significant film and television archive in the world. The BFI actively seeks out and supports the next generation of filmmakers and works with Government and industry to make the UK the most creatively exciting and prosperous place to make film internationally. Partnering with Spectra Logic, OvationData provides total data management solutions to preserve, manage, and understand digital data and media in a way that maximises value. This partner specialises in geophysical data services for the oil and gas industry, as well as full-suite solutions for media & entertainment clients.